« Building the shed house – shouse. How to buy cheap solar panels without getting ripped off. For many years solar panels were very expensive to manufacture and were equally expensive to purchase. The price of panels was very stable at around the $10 per watt mark for a number of years. Manufacture of panels was limited to just a few well-known companies like BP, Sharp, Kyocera and Unisolar. During this time of high prices there were very few issues with quality control. Most panels were provided with long warrantees and because of the big names of the manufacturers, we could be reasonably confident that they would be around in 10 years’ time to honour that warrantee. And there was never any question that a 100w panel would produce 100w when exposed to the Australian sun. Then, about 3 years ago, Chinese manufacturing companies brought their panels to the market. These Chinese manufactured panels were offered to the Australian market at a fraction of the price that we had been used to paying. They carried the same written warrantee and looked pretty much the same as the name brand panels. I have tested a few of these panels, and in each case they performed to specification. Over the next few years prices continued to fall to the point that as I write this (Nov 2012) it is possible to purchase panels for less than $1 per watt. All of this seems like a dream come true to a caravanner or motorhomer wanting to equip their rig with sufficient solar to comfortably live on. There are however some major pitfalls to be aware of when buying panels, I have some first-hand experience of how easy it is to get ripped off by unscrupulous sellers of solar panels. We decided to add some extra solar panels to the roof of our bus to make up for our ballooning power usage. We already had 842 watts and because we had 4 huge (in physical size) 64 watt UniSolar panels, we would need to swap two of these for 200 watt panels – giving us an extra 272 watts – or 1114 watts in total. After doing some research on eBay I purchased two 200 watt panels from LHP (Luxury Home Products) for $555.00 including delivery. When these arrived I immediately commented that they looked too small to be 200 watt panels. I unboxed them and looked for the spec label. This was a sticker printed on an inkjet printer that simply said 200w. I immediately placed both panels in full midday sun and measured the output at 160 watts. So, it seems that LHP are purchasing 160 watt panels and selling them as 200 watt panels. For the average buyer this would be a big issue, most people have no ability to test panels and would therefore simply accept the overrated panels at face value. A quick Google search produced a number of results for exactly the same scam – a number of these mentioned Luxury Home Products. My story had a happy ending, because I paid for the panels using PayPal, there was at least a good chance that I would get my money back – I ended up negotiating with the LHP and getting the two panels for $100, which is not a bad deal for two 160 watt panels (32 cents per watt). So how can the average purchaser avoid issues like this without paying the high prices demanded by the big name manufacturers? The most obvious thing is to consider the price. The old saying “if it seems too good to be true, it probably is” is very applicable. If the panels are considerably cheaper than others of the same specifications – be sceptical. Get the FULL specifications in writing before you buy. This will include values for Open Circuit Voltage, Short Circuit Current and Current at Peak Power. If the seller cannot supply these values for the panel, look elsewhere. Get the physical size of the panel and compare it to a known (name brand) panel of the same output wattage. Glass panels are somewhere between 15% – 17% efficient. This means that to get X watts from a panel it MUST be y square meters in area. There is (currently) no magic that can make high output panels smaller (if there was don’t you think the big boys, BP, Sharp etc) would already be using it?). Test the panels as soon as you get them. Do this by measuring the current when the panel is short circuited in full midday sun. This short circuit current should be close to the specified value. And when multiplied by the panel voltage, close to the specified wattage (within about 10%). Let’s face it, none of us expect a 25 year warrantee to be worth the paper it is photocopied onto when purchasing solar panels manufactured by an unknown company in China and sold on eBay by an unknown seller. So it would be wise to consider the warrantee valueless. The alternatives include buying panels at retail outlets (like Jaycar and any of the massive number of new solar energy companies that have sprouted almost overnight) OR sticking with the aforementioned name brands. Both of these options will likely leave your wallet considerably lighter. In my mind paying one quarter the price for a set of panels (admittedly with no effective warrantee) allows me to either buy 4 times as many for the same money OR replace them 4 times and still be in the same position. For this reason I feel it is worth the risk as long as you apply some common sense and follow the recommendations above. Have you purchased panels and been ripped off – or perhaps got a good deal? Do you have any tips you would like to add? Why not add a comment in the box below so we can all learn from your experience. This entry was posted on Saturday, November 3rd, 2012 at 11:17 am	and is filed under Caravan, Electrics, Motorhome, Power, Solar, Technology. You can follow any responses to this entry through the RSS 2.0 feed. You can leave a response, or trackback from your own site. We also purchased our panels from the same place. Initially we purchase just a single panel for the trailer to ensure that it worked without any dramas. It was so good that we decided to buy 3 more for the Motorhome. When they arrived the three of them were different, one of them obviously 2nd hand, holes top bottom & middle of panel and an arm attached. Several phone calls later and they organised a courier to pick them up and sent replacement panels. This delayed the start of our trip and we ended up leaving before they arrived having to pay a courier to ship them to Calingiri. This time all identical and none 2nd hand. Although we haven’t done a test like you have they appear to be working fine. HI Gavin, I found out about these guys and decided to purchase elsewhere. I even visited their show room being local at the time. There are plenty of stories of them supplying underrated panels, they always seem to come to the party when questioned. I just wonder how many have purchased form them who never realise they have received these underrated panels as they are doing the job. yes you have to be very careful when buying from the internet. These days when folks ask me to size up their solar requirements, I regularly tell them that because solar is so cheap they are best off putting as much as they can fit on their Motorhome or Caravan roofs, and I send them to look on eBay to buy them! But I always warn them to compare the physical size of the panels (mm²) against the better known brands like Kyocera and BP (tho NOT Unisolar). $1 a watt, just crazy stuff, but I don’t know how long it will last. Thanks Gavin for bringing this to the attention of our fellow Rvers. Looked into this outfit a bit – the talk is good and they seem to be fairly straight up. All the negative feedback seems to relate to misunderstandings. I don’t like that there are photos of two totally different panels on the advert – this suggests that they are selling whatever they can get at the time. This makes it less easy to believe the quoted specs. Would you mind giving me your opinion on these panels if possible. Thinking of buying them for out motor home. The panels look fine. I like that each panel comes with an individual test report. I have dealt with this supplier before and not had any issues. One word of warning … 250w panels are very big (possibly too big for mounting on a motorhome). The issue is that the huge sheet of glass can flex as you go over bumps and potentially break. You would need to be very careful with the mounting. I would consider some sort of foam support right in the middle of the panel to reduce bounce. Thank you for the reply its appreciated.. Thought had crossed my mind to about flexing, would say firm closed cell foam stuck up under them on another central rib of frame cause any shorting out problems when wet. Bus is 12m’s but getting a bit short of room up there with escape hatches and vents. etc. Would rather less and larger wattage than less than more panels if possible. At $1.40 per watt they are not the best value around – but the specs look ok.
hi gave yer ur right with the $1.40 beening a bit high , im looking at these 180w aswell , seems cheap, im concered that there is only 2 bypass on them and there set up a little diff than pannels ive seen b4 , do u think the specs seem ok ? These panels have been modified by Marsol Industries QLD to suit Australian conditions with a single junction box, all warranties to be directed through Marsol Industries and not Canadian Solar. I quite like these ones. Thicker frame is better. None of the specs worry me. The photos showing the clamp meter at different positions are what I am talking about with the panels shorted out. This should read a value close to the ISC figure (current at short circuit). To figure out the size of the controller required – take the total wattage and divide by the system voltage. eg 1440/24 = 60 thus at 24v you will need at least a 60amp controller. If the system voltage was 12v (1440/12=120) you would need at least a 120amp controller. Most controllers will handle battery voltages between 12v and 36v or even 48v. is it possible to run 2 regs into one bank of batt , either mppt or a pwm ? Yes – this will work – but it is not the ideal situation. There are a few issues with this setup, it is better to have just one regulator. If you have more than one they should be identical and setup exactly the same. These look too good to be true – I would take care. The specs look fine, but they are too cheap. I have just paid for 2 x 200watt panels before reading this thread. I am now suspicious because your calculation and the seller seem different. Because the seller is saying 23Amps for both then should I assume they are not 200Watt panels? These panels will never produce 23 amps in a real situation – the short circuit current is 11.15amps each. This is the maximum they can every produce under extreme conditions. However, the specifications for these panels (if the panels actually perform to this spec) suggest that they are 200w panels. I recommend doing the short circuit test as described. Another good indication is the size. The panels are 1320mm X 990mm = 1.3msq the test conditions call for 1000w/m2 and they claim and efficiency of 16.8%. at 16.8% conversion a panel this size could (in theory) produce 218watts. In short – the specs look ok – test the panels once they arrive and let us know what the results are. 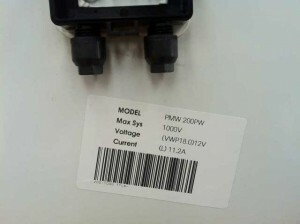 Can you suggest where i could purchase say a 150W solar panel with regulator and kit to fit it to my caravan to charge a 200A deep cycle battery.At a fair price so i wont be ripped off. eBay is still a good source of quality solar panels, you just have to be very careful. I have dealt with a seller who sells Hurricane branded panels via eBay (he is the only one who sells these panels) – I have had no issues. Lots of regulators are quite happy to have more panels attached to them than they are rated for (Plasmatronics, morningstar to name a few). They protect themselves by preventing a charge greater than their rating in circumstances such as the one you mention. Typically cold panels do not produce more current, they produce more voltage. This is of no use to a standard PWM controller – BUT an MPPT controller can make use of the additional power produced during cold conditions. The spike you see is more likely to be due to increased solar radiation caused by a double reflection (the sun hits the ground that reflects some light back up, then the clouds reflect this back down – this gives the panels a (sort of) double hit of sun. It is particularly noticeable when you are near water that is a better reflector that the earth. I believe there is a little more information required when setting up a solar system. Is it correct that some batteries will only accept a maximum rate of charge, regardless of the amount available for input? On both my van and ute I have two 100AH Gel batteries. Initially I used a Cetek 250S Dual regulator, but found that this would only deliver 20 amps maximum. I added a Cetek Smartpass to enable me to use output from both solar and alternator. With this system, if the batteries will accept the charge I can input 80 amps. So far I’ve been very happy with the outcome, especially as the Cetek system will provide the 14.5 volts necessary with Gel batteries. I have [another] question about panels I need answering. I expect you answer many, so thank you for your sterling effort. Flexi panels from jaycar? 100 watters, their dear but I have the chance to get a few without the markup. Not $399 each but maybe $250. Same panel. Seem to produce up to 14 amps x 2 together. My question, are they as reliable as the hard type? They are very, very light compared to hard ones. Seem to be popular? Are they worth it? Maybe I’ll macgyver foam underlay like camping mat to keep heat down? Any other thoughts? Thanks you champions. Up in Qld eh? How ya finding it? I have never liked the flexible / semi-flexible panels. They always seem like a compromise between output and ease of mounting. I would suggest that they are for “when nothing else will fit”. Look at the warranty vs solid panels. I confess that I have not had direct access to the Jaycar panels. what`s the standard size in mm for a 200 W panel? have see two one has a maximum system voltage 600V the other 1000V both sizes are 1580×808 11amps optimum output ,looking at connecting to a 120 amp agm battery,can you please recommend what parts i need to properly connect to battery. Been reading a lot of your posts and thank you for sharing. I suggest doing a Google search and checking the physical sizes of known brand panels (eg Sharp etc) – this will give you a good baseline. 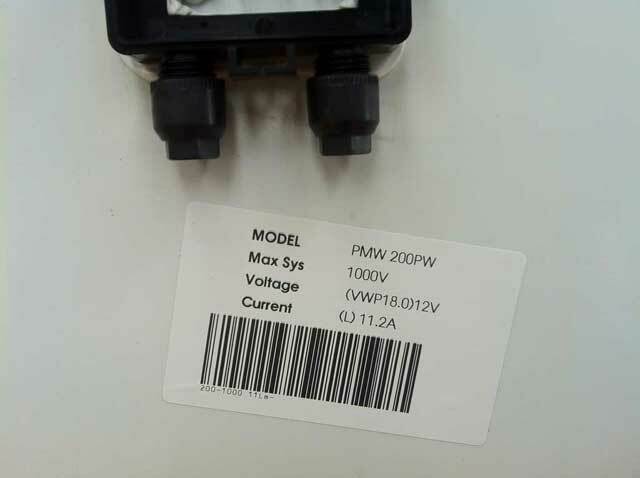 The panel max system voltage means nothing unless you plan to series connect a lot of panels together (in a large house type setup). Just one comment on ratings. I understand that the published rating of a solar panel is standardised and is the output under short term (very short) simulated solar irradiation at one kilowatt per square metre. This is impossible to realise under real world conditions so only serves as a way of comparing one panel to another. That is correct – unfortunately it gives little indication of real world performance. Hi Gavin, Have had a 200 Watt Hurrican panel on my RV stop powering my BMS. Checked Voc 19.5 V, Isc = 8.5 A, Voltage checked with Ampmeter Isc = 15.5 V. Connected to 12v 1/2 discharged battery, no amperage output. Sorry, I don’t know anybody who can repair panels. Please let use know if you find anybody to do the job.